Received a staggering 3.3 million donated items. 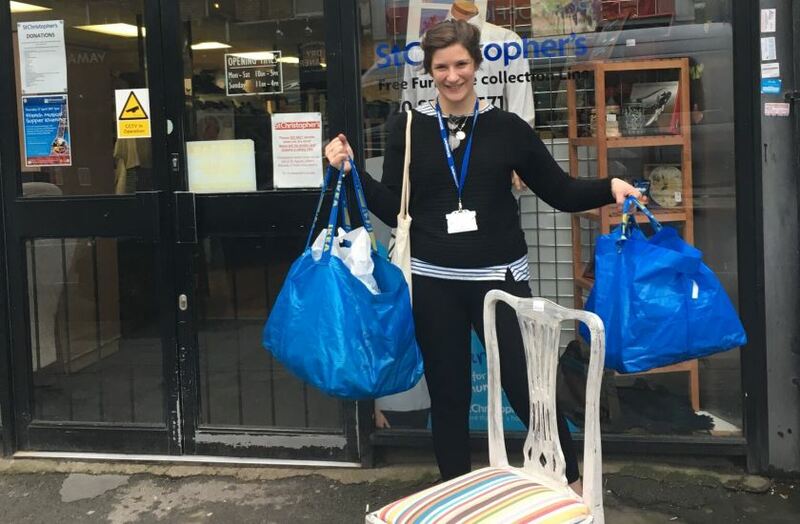 We’re always looking for items to give a loving home to so please think of us next time you’re having a clear out – your unwanted items are someone else’s treasure! Pictured above is Emily from our Communications Team with her latest bargain purchases from our Dulwich shop. Whilst waste collection might not be the most glamorous of topics it’s one that’s got us really excited this month as recent changes have meant we have yet another badge to add to our green credentials! Recycling – we’ll start to roll out a programme of recycling throughout the site, starting with the main kitchen. We’re looking to start small with our waste disposal plans but hope to roll out this initiative across the hospice over the next 6 months. More information on what you can recycle and where will be displayed over the coming months. We’re delighted to share the news that we will shortly be having solar panels installed at the hospice! These panels will be funded by a local group of Lambeth and Southwark residents known as Sustainable Energy 24 who believe that communities, regardless of financial resources, should have access to the benefits of affordable low-carbon technologies. The new solar panels will help us make energy savings so that vital funds can be released to support patients and families as well as helping us to meet our environmental objectives. Installation is planned for July 2017. The new solar panels will save us £20,000 in electricity costs over 20 years!